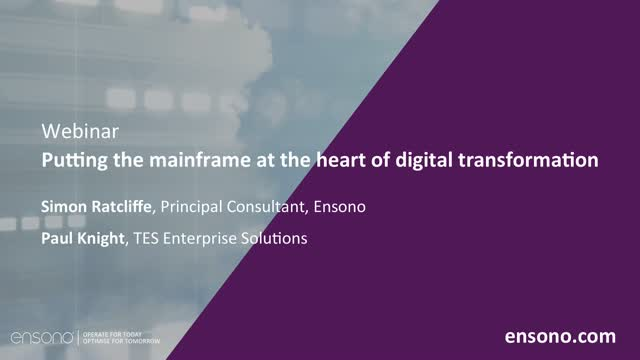 Leading managed services provider Ensono talks about putting the mainframe at the heart of your digital transformation and how it can be a critical element of your modernisation and transformation journey. Listen to Simon Ratcliffe and guest speaker Paul Knight from TES discuss how the mainframe has been used traditionally and how it is still an important modern development platform today. •Is there a skills gap? If you have further questions for either Simon or Paul you can email them here. Leading managed services provider Ensono talk about delivering on the promise of cloud and how it is a critical element of your modernisation and transformation journey. Listen to Simon Ratcliffe, Sean Roberts and Steve Braden discuss what to do once you’re in the public cloud as well as other important topics such as innovation in the cloud. •Once you get to the cloud, what do you do there? •How do you get more out of the cloud and continue to drive innovation as well as control costs, boost agility etc. •What does transformation really mean? If you have further questions for either Simon, Sean or Steve you can email them here. Leading managed services provider Ensono talk about how to develop a cloud strategy and roadmap and how it is a critical element of your modernisation and transformation journey. Listen to Simon Ratcliffe and Sean Roberts discuss the crucial steps when moving applications and workloads to the cloud as well as other important topics. •IT Cloud Culture – big bang or evolution? •Budgeting in the cloud – how lots of organisations get this badly wrong and how to budget correctly. If you have further questions for either Simon or Sean you can email them here. Find out how to use Azure Automation, Microsoft's replacement solution for System Center Orchestrator (SCOrch) to automate workloads in the cloud. Learn about Automation Accounts, Runbooks, and the various ways to trigger them, including Schedules, Webhooks and the built-in Test Pane, to author, modify and execute your PowerShell automation workloads directly in Microsoft Azure. Also learn how you can use Hybrid Workers to extend this functionality to your on-premises environment, and run automation activities orchestrated via Azure, against your on-premises infrastructure. What is PowerShell DSC and how can I use it alongside Azure Automation to configure and manage my infrastructure in the Cloud using Infrastructure as Code (IaC)? Join this session to see how you can make use of Azure Automation's Serverless design to quickly and easily deploy, configure and manage resources, both virtual and physical, on either Windows or Linux, in the cloud or on-premises. Leading managed services provider Ensono talk about restructuring your IT team and how it is a critical element of your modernisation and transformation journey. Listen to Simon Ratcliffe and guest speaker Hutton Henry discuss the mix of knowledge, behaviours and other important aspects of restructuring your IT team successfully. If you have further questions for either Simon or Hutton you can email them here. If you have further questions for either Simon or Olly you can email them here. A 2018 survey of Enterprise organisations by Ensono and the Cloud Industry Forum showed that 89% of the 500 participants surveyed indicated that legacy technology within their businesses were preventing or hampering their ability to execute effective digital transformation. Perhaps the greatest legacy within many organisations is the mainframe estate that brings the challenges of punitive vendor commercials, risks with maintaining on-going skills, lifecycle planning issues and the sheer volume of residual workload that remains within these estates. With increasing pressure to modernise the applications, methodologies and tooling surrounding these legacy environments, the mainframe is often seen as holding businesses back but does this need to be the case? This webinar will explore different approaches to enabling these legacy systems to be part of the transformational journey rather than a blocker and examine how organisations can re-define the legacy blockers as positive rather than negative attributes. Join this live panel discussion with experts at IP Expo Europe 2018 as they discuss the evolution of serverless architectures and what to expect for the next generation of cloud. - What exactly is a serverless architecture? - How can your IT architecture be serverless and what does this mean for your tech teams? Join this Ask the Expert interview with Fortinet's Patrick Grillo. Join this Ask the Expert interview with LogRhythm's Jonathan Zulberg. As Senior Sales Engineer at LogRhythm, Jonathan assists organizations with designing and implementing solutions that reduce their threat landscape and enable early detection of malicious behaviour with LogRhythm solutions. I lead threat modeling workshops, as well as threat analysis sessions, to assist organizations in maturing their current security posture. Join Ensono Global Director of Cybersecurity Ben Banks for a timely and informative session on machine learning and security. - Making correct inferences and deductions from small indicators combined with larger datasets (should we start to correlate data about our clients share prices and related news items). - The importance of the reveal (integrability) i.e. "Holmes....how the devil did you know?"